An added bonus is All Slots Casino’s 24/7 online customer support. An industry leader since 2000, All Slots Casino is a member of the famed Fortune Lounge group of casinos which is licensed by the respected Malta Gaming Authority regulatory agency and is accredited by eCOGRA (eCommerce Online Gaming Regulation and Assurance), recognized for fair gaming, player protection, and responsible operator conduct. A fountain of awards by Casinomeister Award [(“Best Casino Group” — twice), Online Gambling Insider (“Best Slots Casino”), Casino Man (“Best Online Casino”)] is a testament to the quality, fairness and all-around excitement of All Slots Casino. All Slots Casino is the leader in online slots casinos and offers more than 200 online games, comprising everything from fruit machines, to 3- and 5-reel classic and video slots, including progressive slots. All Slots Casino games are powered by Microgaming. That results in an inventory of the best casino games and new titles added monthly. The world’s leader in casino games would not be the leader unless it also offered the best table games, like online scratch cards, roulette, baccarat, blackjack, video poker, craps, and 3-card poker. The list is almost limitless and includes Mega Moolah, a progressive slot. While playing All Slots Casino, why not join in the tournaments. Don’t play alone, show your prowess against online competitors, where each player starts with equal coins and time on the tournament clock. The prize goes to the player who gets the most coins. It’s the best fun you can have in your pajamas! All Slots Casino offers first time players a Welcome Bonus in four tranches that match each of the player’s first four deposits. That works out to a maximum total bonus of NZD1,500, for just NZD1,200 initial deposit within 7 days of signing up. Regardless of the many choices you select, you will be at ease because eCOGRA certifies that every game it sanctions is functioning properly and that you have a reasonable chance to win. The casino will let you know the current payout rate complete with a monthly report, which recently showed a general average rate on return (ROR) to a player of 96%. Mobile casinos allow you to play anywhere, on iOS, Android and Blackberry devices, complete with a NZD5 no deposit bonus. Spin3 offers 19 cutting edge, hyper-realistic mobile casino games. All Slots Casino offers a variety of depositing and withdrawing methods, including Visa, Click2Pay, Neteller and many more. Customer Support in the form of live chat, phone, or email is available 24/7 in multiple languages to answer your questions. All Slots Casino simulates the awesome real-life casinos in Las Vegas. 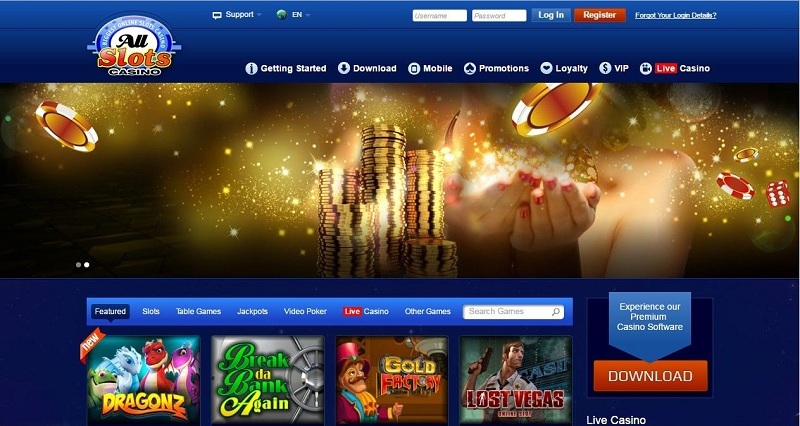 The focus is on video slots because they are currently the most popular on the internet. Get started with your choice of many titles, a Welcome Bonus, easy sign-up, secure payment, and several methods of banking. Cashing out and withdrawal requests are handled within a few days. Mobile Fair Play Guaranteed and Security AssuredAll Slots Casino is the leader in online slots casinos and offers more than 200 online games, comprising everything from fruit machines, to 3- and 5-reel classic and video slots, including progressive slots. All Slots Casino games are powered by Microgaming. That results in an inventory of the best casino games and new titles added monthly. The world’s leader in casino games would not be the leader unless it also offered the best table games, like online scratch cards, roulette, baccarat, blackjack, video poker, craps, and 3-card poker. The list is almost limitless and includes Mega Moolah, a progressive slot. While playing All Slots Casino, why not join in the tournaments. Don’t play alone, show your prowess against online competitors, where each player starts with equal coins and time on the tournament clock. The prize goes to the player who gets the most coins. It’s the best fun you can have in your pajamas! Fair Play Guaranteed and Security Assured?